In Key Stage 4 we offer courses in order to provide a more personalised curriculum. 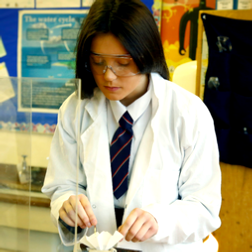 Students follow AQA GCSE Science Suite of qualifications. Students will develop knowledge and understanding of different Science ideas and contexts. They will develop their skills and understanding of how science works. Students will undertake practical and investigatory activities throughout the course. There are six written examinations at Foundation and Higher Level. The course will enable students who obtain the required grades to progress to GCE A Levels, BTEC Nationals and other post 16 Science related programmes. Students will study Biology, Chemistry and Physics and develop their knowledge and understanding of different Science ideas and contexts in greater depth. They will develop their skills and understanding of how Science works. Students will undertake practical and investigatory activities throughout the course. There are six written examinations at both Foundation and Higher Level. This route is only suitable for those students who have definitely decided to concentrate on Science. Students will be invited to study this course after year 10 assessments.